The Dad Games challenged you for four weeks to be a “Gold Medal Dad.” Each week we provided a checklist of seven actions to help you connect with your family. The final week's challenge is Gold Medal Dads...Set Goals To Improve. Over the last few weeks, you have been challenged to spend time connecting with your kids, working on your relationship with your spouse/mom of your children, affirming your children, and balancing work and family. Dads, after a month of challenges, you have gold medaled in fathering! We hope as a result of the last month of challenges, you are a better family man than you were in June! It’s been a blast to be challenged, learn from other dads, and connect through The Dad Games. This closing week of The Dad Games ends on Tuesday August 21 and will be no different! 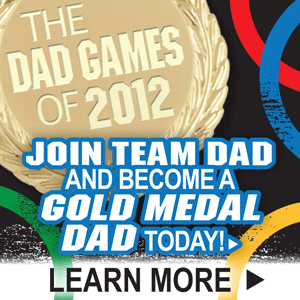 Get details about The Dad Games 2012. This week’s topic is Gold Medal Dads…Set Goals To Improve. Now that you completed four weeks to fathering challenges. What does an Olympic athlete do? He or she continues training, right? Just as an athlete would do, we encourage you to keep training as a dad! We are here to help. We have one final week of ideas for how you can keep training for Team Dad! 1) Identify areas of fathering where you are "winning gold:" Challenge yourself to write down what you are doing well. You have challenged yourself in The Dad Games, there must be something you are doing well. Write that down for this activity. 2) Identify area of fathering where you need to improve: Through the challenges, you may have found areas where you need to improve. Take time to consider areas you need improvement in and write those down for this step. 3) Set three goals to stay strong where you're already "winning:" You have your areas that you are doing well in as a dad. Take those areas and create specific and if possible numeric goals. 4) Set three goals to help yourself improve in weaker fathering areas: Like you did for areas you are doing well in, take the weaker areas and create specific and quantifiable goals. 5) Talk to your team (mom, kids, and other dads) about your goals: You now have your goals, take them and discuss them with your family and other dads. Look for people to come along and help you in areas where you are weaker. Seek out and learn from mentors. Don't wait for other dads to bring this topic up to you, they won't. Take the lead and talk openly about ways to improve as a dad. 6) Post your goals where you will see them and stay focused: Be intentional about keeping your goals in front of you. Take the effort to post your goals somewhere you will be reminded of them in the coming days. 7) Consider being a Double Duty Dad to a kid who needs a father figure: If you have completed all the challenges and created your goals, you are doing very well as a dad to your kids. You’re basically the greatest dad ever! Now, use those professional dad-skills on your community. NFI challenges you to find a child that may not have a father figure and be that influence for that child. Learn more about Double Duty Dad. Question: What’s one area you are working on as a result of The Dad Games? Reminder: To honor your efforts in The Dad Games, we're giving away prizes including sports memorabilia signed by celebrity athletes and free prize packs. How can you win?! Enter by sharing your experiences and connecting with other dads on Facebook, Twitter (#DadGames12), and commenting on our blog (Get more info on how to enter here!). Visit Gold Medal Dads…Set Goals To Improve for tips on training for Team Dad.